Did you know that the Roman Catacombs were not built to serve as secret churches? The Catacombs were truly just burial places. Just like today's cemeteries which have chapels on-site, these early burial places also had built in chapels to perform the final blessing of a body before entombment. While Christians were persecuted at various times, they celebrated Mass in people's homes, under the guise of a friendly gathering, and not in underground chapels. Today the entrance to these early Christian burial sites are found in some of the most unexpected places. The Catacombs of St. Thecla, which I had the privilege of visiting Tuesday, are found in the basement of a building belonging to an Italian insurance company in a residential neighbourhood of Rome. No joking. Of course, the insurance company is a recent addition to the landscape. The Catacombs of St. Thecla appear on pilgrimage maps as early as the seventh century. It's believed there was a shrine to St. Thecla not far from today's Basilica of St. Paul Outside the Walls, in the place Thecla was believed to have been buried. However, today it is not certain if the St. Thecla referred to was the virgin saint referred to in ancient legends. It was in the 19th century that the Catacombs were rediscovered by archeologists. Fast forward to 2008 when the Pontifical Commission for Sacred Archeology was attempting to restore a portion of the Catacombs. Most of the Catacombs are chambers with crypts all the way up the wall. It seems at some point there was a plague and large numbers of people needed to be buried all at once. Hence these mass crypt chambers that could then be sealed off. In one wing of the Catacombs, however, was a crypt that seemed to have housed only two bodies. It was this chamber that the Commission for Sacred Archeology wanted to restore. Generally a private crypt means a noble family, which means it was no doubt decorated. In fact, faints hints of frescoes were evident in this special crypt, referred to in archeological terms as a double cubiculum. The conditions in the Catacombs are cool and very humid. The archeological team set out to restore the frescoes using mechanical processes to remove calcium lime buildup (the water in Rome is highly calcified, good for bones, bad for cleaning). Then the team heard about lasers being used in the restoration of facades of churches and statues. The idea was floated, "why not try using a laser on this crypt?" So a special laser was brought in and modified to work in highly humid conditions. According to Dr. Barbara Mazzei the laser works on tiny portions at a time. The beam hits the calcified material and causes a chemical reaction that produces a mini-explosion. That mini-explosion causes the calcium lime to fall off the surface of the fresco, revealing the original image. 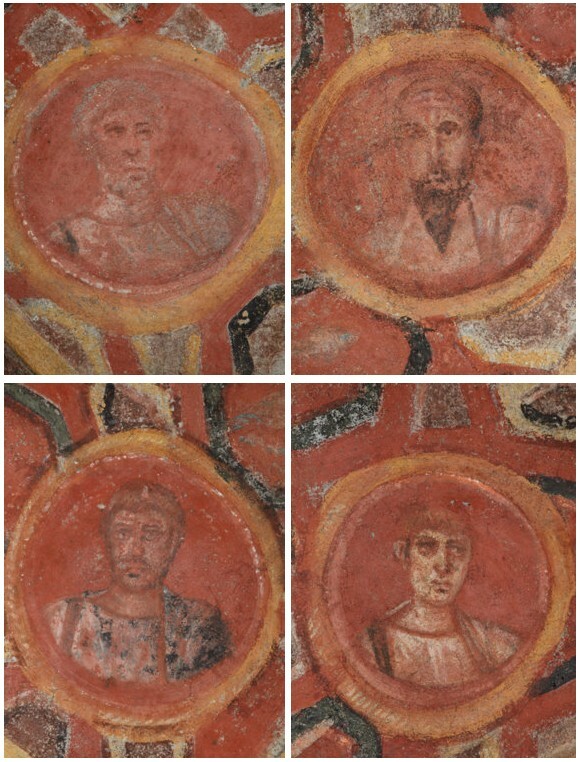 Two years of work revealed four images that have been identified as images of the Apostles Peter, Paul, John and Andrew, as well as an image we would recognize as The Good Shepherd. Over the main entrance to the cubiculum one can see an image of what looks like hands outstretched around a table. The Twelve Apostles. Over one of the actual burial slots there is a visible image of a woman in noble dress. There's one slight problem with this Catacomb. It's very, very delicate. 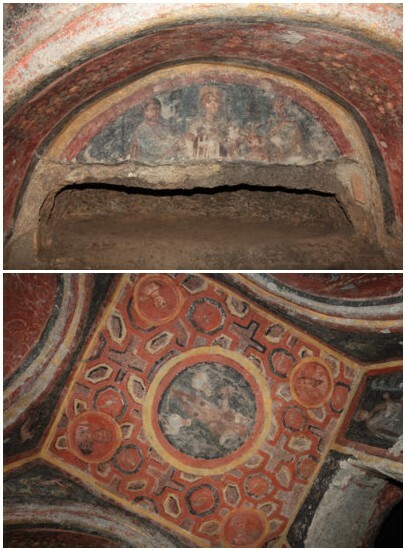 The area above the Catacombs is very moist and that constant exposure to humidity is damaging to the frescoes. As one archeologist told journalists, "we've got a choice, preserved Catacombs or pretty flowers" referring to the fact that there is a garden above one portion of the Catacomb and the water from the flower bed filters into the Catacombs. However, placing dehumidifiers in the Catacombs alters the delicate micro-environment and can cause a whole host of other problems. For that reason this Catacomb will not be open to the general public. Viewings will have to be requested through the Pontifical Commission for Sacred Architecture. Visits will only be allowed for a certain number of people at a time and visitors must hire a guide who has been approved by the Commission. There are, however, five other Catacombs in Rome open for public viewing.